Tensions run high as one man stands alone in a town filled with toxic greed in Ohio Wesleyan’s first theatre production of the academic year. 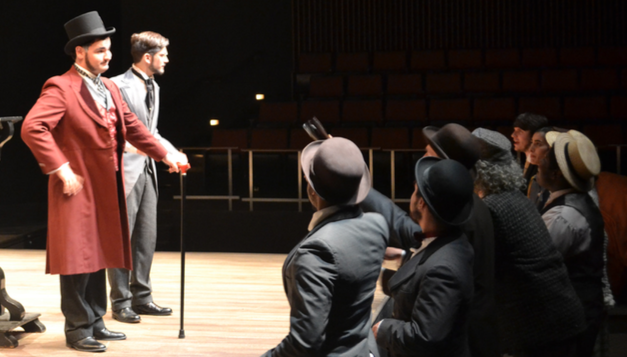 OWU’s theatre and dance department is presenting four performances of “An Enemy of the People” by Henrik Ibsen at Chappelear Drama Center. The Norwegian play revolves around the struggles of one man’s fight for truth against those who stifle it for personal and political gain. Though the play was written in 1882, its themes remain relevant as it parallels current water disasters in Flint, Michigan and throughout the country and world, said Elane Denny, professor of theatre and director of the play at OWU. More than 50 OWU students are involved with the production and rehearsals began in late August. Environmental programs and clubs at OWU will also have displays in Chappelear’s lobby in conjunction with the show, said freshman Josh Martin who portrays Dr. Stockmann, the protagonist. Martin said he was first introduced to Ibsen’s work and “An Enemy of the People” in 8th grade. The play also stars junior Daniel Haygood as Peter Stockmann, Dr. Stockman’s elder brother; and freshman Sarah Gielink as Petra, Dr. Stockmann’s daughter. Haygood said he hadn’t intended to perform in any plays this year until he read the script and realized he couldn’t turn down the role given the timing of the production with the upcoming election and the Flint disaster. Ibsen’s pieces are generally regarded as serious, but during rehearsals, the actors experimented with the script, approaching it in different, sometimes comedic ways, Martin said. Gielink said that was one of her favorite moments during rehearsals. “There are definitely funny moments that you might not get reading it the first time, but how some of the characters interact with each other physically is very funny,” she said. The three actors said they are looking forward to having an audience on opening night because they contribute to the actors’ energy on stage. “I hope the audience will take away the message of hope that [the play] leaves with and how the struggle for fighting for truth isn’t an easy one, but it’s necessary,” Gielink said. “An Enemy of the People” was held on the Main Stage at Chappelear Oct. 6 through Oct. 9.